Today’s—and tomorrow’s—most successful companies are creatively adapting to unceasing change and uncertainty by encouraging leadership at every level of the organization. The new competitive requirements—quality, innovation, customer responsiveness and flexibility—demand an organization filled with people taking the lead in improving processes, collaborating on products, and responding appropriately to ever-changing markets. Yet many people have been taught to expect all leadership to come from above. Rather than taking initiative and working collaboratively to solve problems, they wait, with increasing impatience and cynicism, for management to provide detailed direction. Managers, while struggling to get better results with fewer people and resources, are realizing that full participation is not “good,” it is critical. “Leadership Is Everyone’s Business” prepares your organization to weather today’s competitive storms and squalls with an “all hands on deck” involvement. This intensive two-day program develops the leadership awareness and competencies of all employees. It offers a proven and highly interactive blend of short lecture, case study, individual and team exercises, and action learning activities. The program is designed for front-line supervisors and their teams. It can provide a valuable opportunity for teams from different functions to work together and develop a shared commitment to the organization’s mission, values and leadership culture. Program content is based on the award-winning book, The Leadership Challenge, and the acclaimed management workshop based on its research. 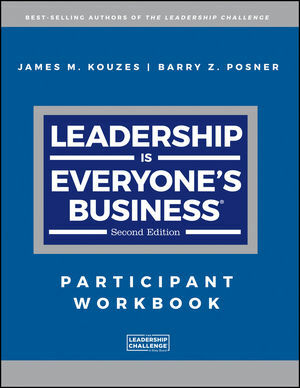 Authors Jim Kouzes and Barry Posner studied leaders for over ten years and identified the Five Practices of Exemplary Leaders® that are key to the most successful and productive leaders. Participants in “Leadership Is Everyone’s Business“ discover how they have shown leadership in the past to meet business and personal challenges, allowing them to gain the confidence and skill to increase their use of these practices on the job. • Recognize how leadership is key to their ability to succeed in challenging situations at home or a work. 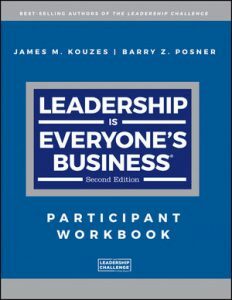 • Identify their leadership strengths and areas for improvement. • Model the Way by ensuring personal values align with corporate values. • Inspire a Shared Vision by contributing to their team’s vision of the future. • Challenge the Process by exploring and problem solving opportunities for improvement within their team. • Enable Others to Act by understanding their unique value to the team and appreciating the contributions of others. • Encourage the Heart by recognizing the value of giving and receiving recognition from peers.